The 25th Anniversary and what a Show! Blessed again with glorious weather it celebrated with a rally bigger and better than happened anywhere before. Weeks from the opening exhibitors began their journeys from all directions. Harvesting was in full swing to clear the site for their arrival. Four heavy haulage engines set out on an an epic road run transporting a railway engine, their display load, to the Something that had not been seen in living memory. Hundreds of people lined the the route, drivers stopped the cars, disbelieving their eyes, everyone waving and cheering. The sight of these mighty machines from the past entering the Showfield was simply unforgetable. All the different parts of the rally had made an extra big effort to please the 250,000 visitors. The special theme of the rally were the products of Aveling & Porter of Rochester. "The Greatest Show on Earth" was born. A spectacular line up 100 showmans engines. All sections made an equally big effort to please the 250 000 visitors. 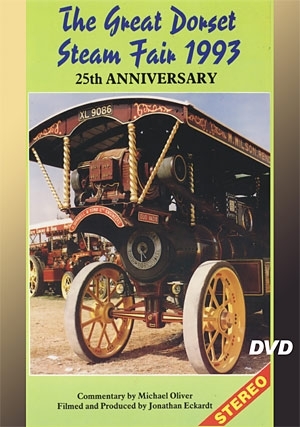 The special theme - the products of Aveling & Porter of Rochester. The only 4 hour film ever.